City of Peterborough Swimming Club (COPS) once again showed their class when hosting round three of their popular Mini Meet Grand Prix series at the Regional Pool for swimmers aged 12 years and under. They collected 14 wins, 16 second places and 10 third places as personal best (PB) times tumbled and East Region Championship qualification times were secured. Two COPS swimmers took maximum points with three wins out of three on the night. Eleven year-old James Rothwell topped the podium in the 50m backstroke, 200m freestyle and 50m butterfly and his time of 35.69s in the latter secured him his first East Region Championship qualification time. Joining Rothwell with a hat-trick of wins on the night was Stella Blakeley (11). She won the 50m freestyle, 50m breaststroke and 200m individual medley events. Fabian Brudnicki (12) took two first places in the 50m butterfly and 200m freestyle events and a second place in the 50m backstroke. Brenna Howell (12) claimed first place in the 50m freestyle and in the 200m individual medley her six-second PB placed her second in the East Region rankings for that event. Ruby Blakeley (9) added to the family joy with her own first place in the 50m breaststroke and two second places in the 50m freestyle and 100m individual medley events while Stan Scarborough (9) took first place in the 200m freestyle and two second places in the 50m butterfly and 50m freestyle events. Connor Walker (12) won the 50m backstroke and gained second place in the 50m butterfly and 200m freestyle. 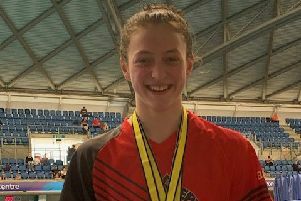 Sophie Griffin (12) stood on each step of the podium as she took first place in the 50m breaststroke, second place in the 200m individual medley and third place in the 50m freestyle. Other COPS top-three placings: George Whiteman (11) 2nd 50m fly and 200m free; Kieran Griffin (9) 2nd 200m free, 3rd 50m back and 50m fly; Lauren Browne (12) 2nd 50m breast, 3rd 200m medley; Laura Fehrenbach (10) 2nd 200m medley, 3rd 50m free; Bert Papworth (10) 2nd 50m back, 3rd 50m fly; Olivia Bearman- Skipworth (10) 2nd 50m breast; Holly Graves (11) 2nd 200m medley; Erivan Hamid (11) 3rd 50m fly, 200m free; Mark Goodes (11) 3rd 50m back; Amy Paget (10) 3rd 200m medley; Jamie Peacock (9) 3rd 200m free. Other COPS swimmers in action were: Lilly Borgognoni (12), Harley Brown (10), Briony Burmby (12), Eleanor Byrne (10), Belle Cameron (9), Joel Coulson (11), Lucie Creedon (10), Chloe Elliot (11), Lewis Flower (11), Sophie Galjaard (12), Keiran Griffin (9), Lili Griffiths (12), Panche Gurev-Markovacev (10), Tegan Hughes (10); Isabel Ilett (11); Hannah Jakeman (12); Mia Karagholi (9); Kirsten Loutit (11); Joshua Martin (10); Ella McGhie (12); Kate McLoughlin (12); Matthew McLoughlin (9); Ella Normington (10); Josh Smith (10); Megan Smith (9); Ella Spencer (9); Joshua Spencer (11); Jemima Tuffnell (10); Mia Turvey (9) and Kieran Underwood (10).